Looking for a learning center for your little one? Along with our new facility, Imagine Academy has experienced, loving staff who will provide the best quality education and care for your child! I am graduate of Penn State University with a Bachelor of Science Degree in Elementary Education. Some of my experience has been as a substitute teacher, kindergarten teacher, preschool aide and currently preschool teacher. 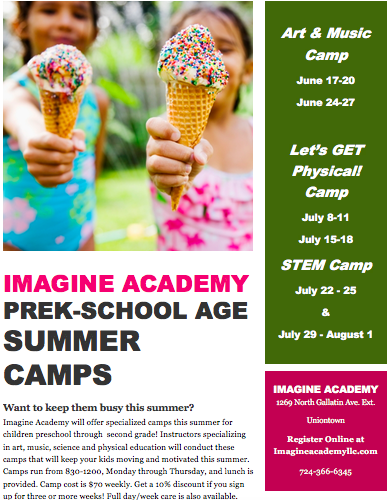 I am very excited about my new venture here at Imagine Academy. I am looking forward to being your child's teacher. I am married to a Steve Bilohlavek. We have 2 wonderful children. Allison, a senior, at Serra Catholic and Alexander, 8th grade, here at Frazier Area School District. I have a yellow lab named Maui. Outside of school, I love to travel, walk, snow ski and spend time with my family. We hope you decide to start your child's educational journey with us.